Detergent ENZYCLEAN IV Multiple Enzyme 4/1 gal.Weiman® Enzyclean® IV Multiple Enzyme Detergent is specially formulated for use in washing equipment and forsafe manual use. Enzyclean® is used for effectively and safely cleaning glass, plastic, rubber and metal surgicalinstruments and equipment. Enzyclean® provides one step cleaning of delicate fi beroptic equipment. It leavesinstruments moving freely and spot-free. 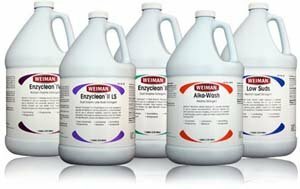 It is designed to be used on instrumentation immediately following thesurgical procedure.Weiman® Enzyclean® IV Multiple Enzyme Detergent minimizes instrument handling, thus reducing exposure topotentially infectious organic contaminants. It ensures the thorough and complete cleaning of equipment andinstruments, a prerequisite to the completion of the decontamination process. The enzymes in this detergentquickly disintegrate organic soils in hard to reach areas, including lumens, channels and box locks. The enzymesbreak down (actually digest) the organic soils, and the detergent removes them completely, holding them insuspension and avoiding redepositing on the cleaned surfaces. Product photo may not exactly match the product offered for sale. Please refer to the product description. If you have any questions about this product by WeimanÂ®, contact us by completing and submitting the form below. If you are looking for a specif part number, please include it with your message.